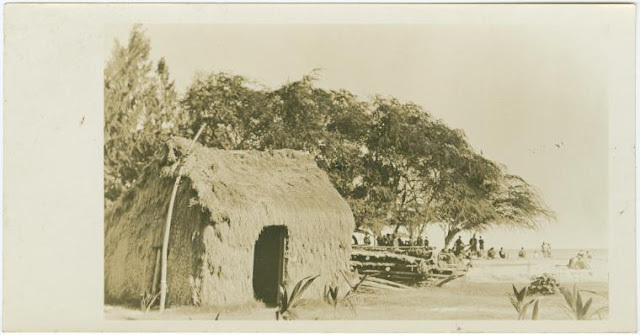 Vintage grass shack at the Outrigger Canoe Club from the NY Public Library archives. Thatched hut at Maui Nui Botanical Gardens. Hmm… I was all set to write about geckos, but geckos are not a stereotypical, cliché Hawaii tourist symbol. No one says, “I’m going to Hawaii to see geckos.” While I did prep a post on them, in the meantime, I’m going to delve more deeply into the little grass shack and the grass skirt, which I touched upon briefly in C for Coconuts. Or like the Hawaiian Canoe Club Hale (or house) in Kahului. Correction: earlier I wrote that, grass shacks are not made of grass either... they are made of coconut fibers. 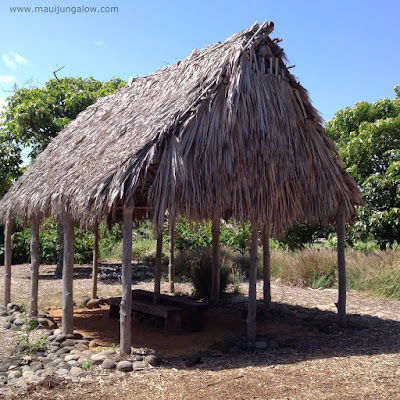 I just found out from someone I consider an authority on Hawaiian culture, that grass shacks were most commonly made from pili grass. Not coconut leaves at all! So there's some truth to the little grass shack! Pili grass is a dense material that can be piled up thickly to practically prevent rain from coming down, which is useful since we can get some good rains here. But she did say that there are some roofs made with coconut leaves, but pili grass is preferable. Here's another interesting link I found on pili grass. Hawaiian Canoe Club headquarters - a real grass shack in Kahului Harbor. Yet, as Flickr member puuikibeach commented, the modern day grass shack in Hawaii is more likely to be made of tin. A modern day "grass shack" in Wailuku, Maui. I'd share the original photo uploaded on flickr, but it's no longer available. To burst another bubble, grass skirts are not really made of grass. I always thought they were made of coconut leaves that were stripped and softened, but in my research, am not finding any historical documentation. And "grass skirts" were not the outfit of choice originally, since earlier Hawaiians danced hula wearing tapa cloth. What were those grass skirts made of? Wikipedia indicates that Hawaiian grass skirts were made out of ti leaves and also hibiscus fibers, but what kind of hibiscus? The hau tree? There are some tantalizing references to other Polynesian cultures who did in fact make skirts of coconut leaves: the Marshall Islanders, the Vanatinai, and the Onotoa. But did the Hawaiians ever do this? 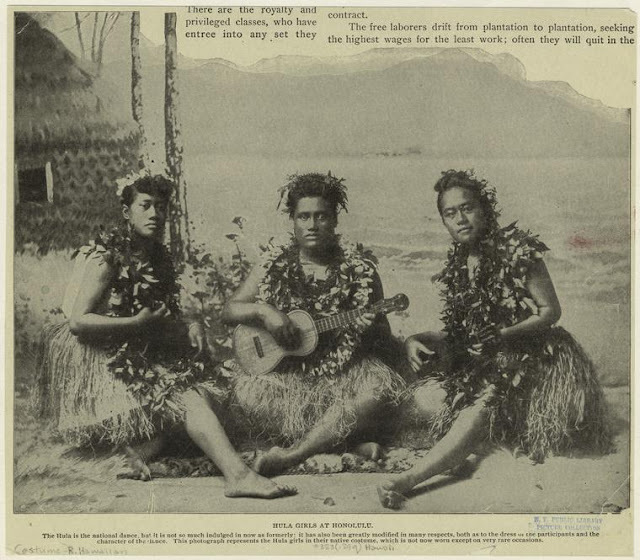 Vintage photo of hula dancers playing ukulele, NY Public Library public domain images. What’s so intriguing about the next photo, which according to pinner Tim Sims was taken by his grandfather stationed in Hawaii in the 1940s, is that the grass skirt in the picture looks like the same material as the grass shack. What was this skirt made of? Raffia?… Was Hawaii importing raffia, which is from the raffia palm which as far as I know, isn't grown in Hawaii? BTW, modern grass skirts sold as tourist souvenirs are made of raffia or plastic. Update: according to my Hawaiian cultural authority, I just found out that some grass skirts, the ones that look very fibrous, were made out of lauhala or hau fibers. Coconut leaves are too stiff (and she doesn't know of any skirts that were ever made from coconut leaves). She also said that pili grass was also not used. She noted that at the most recent Merrie Monarch hula festival, which just finished this weekend, one halau or group of hula dancers, wore lauhala skirts. I just encountered another site that mentions that grass skirts were made of banana leaves, so I'm still going to do more research. Update again: Amazing how malleable online posts are. Found out from Shannon Wianecki that the hau tree was indeed used for making grass hula skirts. Read Mark's blog to find out why he's wearing a grass skirt and coconut bra. And if you want to read more about coconuts, visit C for coconuts. I suspect there is more information out there about what grass skirts and grass shacks were really made of, so if you know something further, please share it. P.S. If you're blog hopping from the A to Z Challenge, please include a link if you comment. P.P.S. Here is the link to Maui Jungalow on Facebook. If you have enjoyed my blog and would love to have an occasional email from me, then sign up for my email newsletter. I am such an incredibly lazy newsletter writer, that in a good month I send maybe two emails. In a bad month, absolutely zero. I will not spam you. I will not sell your email. I myself hate getting junk mail or excessive promotional email. I’m hoping to get to the point of doing an email newsletter once a week, but who knows? You may want to add (mauijungalow (at) gmail dot com to your address book. It's too bad the modern day shacks are made of tin. I like how the traditional grass shacks blend in with the environment. As far as the grass skirts, it sounds like you've got a historical mystery on your hands. You're going to have to do some digging. Let us know what you discover. Nice post, Courtney! Tree houses are fun! There are some secret ones here that I've only seen through photos. I'm amazed looking at old pics how small these houses are compared to nowadays. They were enough. Old images die hard. If I ever get to Hawaii, I was to see grass huts on the beach. Tin is so not romantic.